“Lo-fi, sci-fi,” it was called. I am of course referring to John Galliano’s Spring 2016 collection for Maison Margiela. After assuming the position of creative director in October 2014, the legendary designer has been captivating audiences with his brilliance, wit and bizarre creations that grow all the more loveable per collection. On a SHOWstudio video, the panellists at a viewing of this show commented on how it felt as if there was three independent collections within one. There was a silvery Old Hollywood throwback, the silver screen embodied on a silver catwalk. 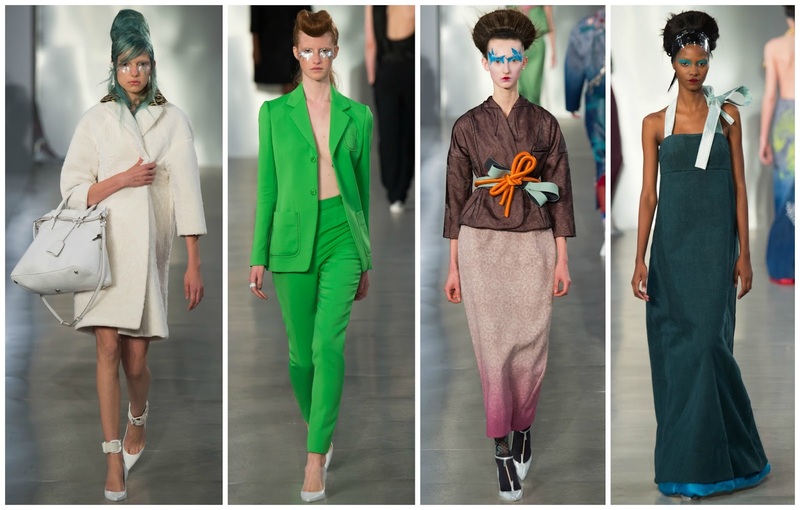 There was a slew of distinctively forties-inspired looks, and then there were geisha-inspired ensembles. How the latter correlated to the others I’m not particularly sure, but watching the show was liking seeing Galliano’s train of thought unfurl before your eyes. The aforementioned Old Hollywood referral contained commercial looks, there were handbags, prim jackets. Of course there were some idiosyncrasies, a leopard lined collar on a white blazer worn with a haphazardly patchwork dress. The obnoxiously large beehives and the wind-swept blowouts, teamed with fishnet tights and gloves were a mesmerising mix of the classy and the… not so classy. This segued into the forties which opened with a male-models wearing an open jumpsuits, and then came Kelly green suits. Moving from the previous segment into a trip to the Far East was stark, intense but simply exquisite. Plastic, liquid-like, and brocade skirts were constructed and furnished with rich, intricate embellishment. Thanks to the silhouettes, the age old tendencies of geisha dress. Splendidly, a golden gown with a silk skirt and a deconstructed bodice took to the runway. Make-up artist Pat McGrath magically transformed the models. A blue-haired Barbara Bruskova opened the show with three platinum stripes emerging from her eyelids. Other models had silver glitter encasing their eyes, others with carefully exacted paintings. Each model had a variation of four or five moulds. Some had only eye painted, à la David Bowie. The hair too added to the theatrics. There were overly exaggerated coifs, and Edo period shimada hairstyles on the geisha girls. Autonomously ruling and delivering his fashion fantasy, the reclusive Galliano is subtly challenging convention, designing what pleases him and the audience best and tailor-making magnificent shows. He doesn’t make an appearance at the end of the show, the brand’s custom, but I’m sure he’ll be pleased to see gleeful attendees, jubilantly applauding his work.